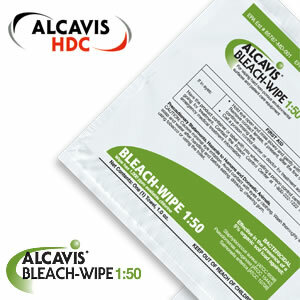 Alcavis Bleach Wipe 1:50 dilution is a prediluted bleach towel that is an EPA-registered (#65787-3) bactericidal wipe. precautions for bloodborne pathogen decontamination at 1,000 ppm NaOCl. in one easy step. This dilution is ready to use, in the presence of organic matter, on hard surfaces. Alcavis Bleach Wipe 1:50 dilution has a stable shelf life of 18 months. Apply towelette and wipe desired surface to be disinfected. Treated surface must remain visibly wet for 10 minutes. Use additional wipe(s) if needed to assure continuous 10 minute wet contact time. Allow surface area to dry and discard used towelette. For use on hard, non porous surfaces including stainless steel, chrome, metal, glass, vinyl, plastic, laminate, linoleum, glazed ceramic tile, glazed porcelain, and sealed or painted wood. 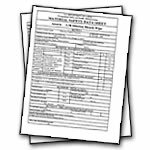 Areas for use include: Medical, Dental and Laboratory Counters, Exam Tables, Carts, Dialysis Machines, Point of Care Equipment, Telephones, Sink Tops, Counter Tops, Floors, Bathrooms, Tubs, Handrails, Door Knobs, Lockers and Desks. • Rutala, W.M. : APIC Guideline and Selection for Use of Disinfectants. Am J Infection Control 1996; 24: 313-342 and Simmons, B. P.: Guideline for Hospital Environmental Control. Am Infect Control 1983; 11:97-115. High-Level Disinfection (semi-critical items [except dental] will come in contact with mucous membrane or nonintact skin) Procedure exposure time > 20 min. Intermediate-Level Disinfection (some semi-critical and non-critical items) Procedure exposure time > 10 min. • Recommendations for the Prevention and Control of Viral Gastroenteritis (Norovirus) Outbreaks in California Long-Term care Facilities: California Dept. of Health Services – Division of Communicable Disease Control 4. "Use an EPA-approved disinfectant or a freshly prepared sodium-hypochlorite solution on a 1:100 (500ppm) to 1:10 (5000ppm) dilution to disinfect surfaces with feces or vomitus." Alcavis Bleach Wipes 1:50 Material Safety Data Sheets (MSDS) include information concerning; Generic product identification, Hazardous ingredients, Physical data, Fire and explosion hazard data, Health hazard data, Reactivity data, Spill or leak procedures, special protection information and special precautions.